The detailed information of a specific visitor can be viewed. The visitor's Name, Visitor Since, Visitor Behavior, Interests, CRM Info, Visits, Actions, etc., will be displayed here. The Visitor Information gives a clear understanding of each visitor on your website, you can browse through the visitors details and know who your visitors are, and what interests them on your website. The details captured about the visitor will be displayed, like the visitor’s name (If the name of the visitor is not captured, then the visitor’s random ID will be displayed), Contact number, City, State, Country, Lead Score, Opportunity, Visitor Since and Photo (Photo will appear only if integrated with Gravatar). Details about Visits, Pages Accessed, Frequency of the visitor, and Source of each visit can be viewed here. 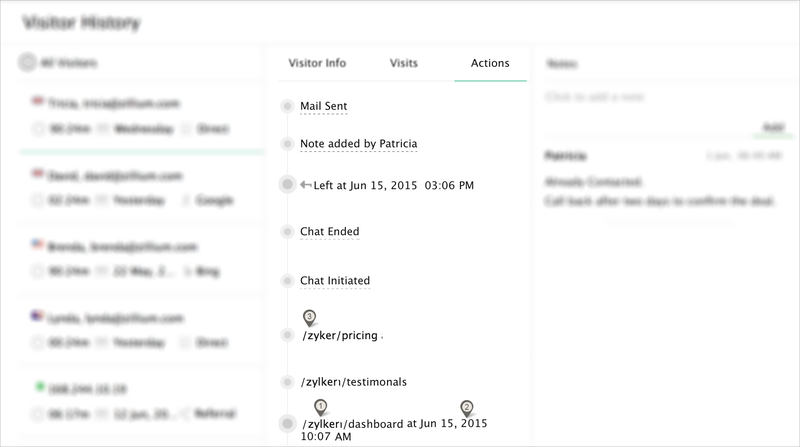 You can view the visitor activity for a period of time by choosing a range in the calendar. Click on the calendar option next to the visitor behavior heading, now choose a range in the calendar. The data below will be changed according to the chosen time period. You can also choose a presets available in the calendar to view the visitor activity. Visits - The number of times the visitor visited your website in the chosen period of time. Frequency of the Visitor - The website visitors' frequency of visiting your website over a period of time will be displayed here. Pages Accessed - Pages accessed by the visitor between the chosen range. Source - The source using which the visitor reaches your website each time. 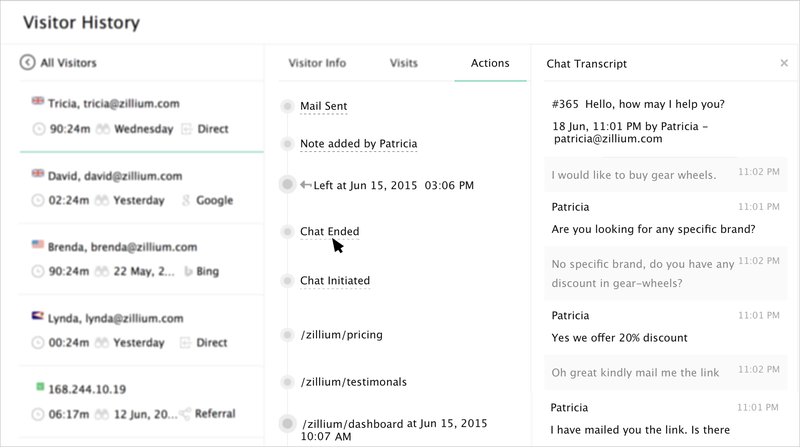 Referral - To know the referrer link, hover over the referral. The top three pages accessed by the visitor will be graphically represented. The name of the page is displayed at the top of the graph and clicking on the link will take you to the page that was accessed by the visitor. The time spent on the page and the pages accessed count can also be viewed in the x and y axes of the graph respectively. If your SalesIQ portal is integrated with Zoho CRM, then the CRM info like Name, Visitor type, Source and Lead Owner name will be displayed. 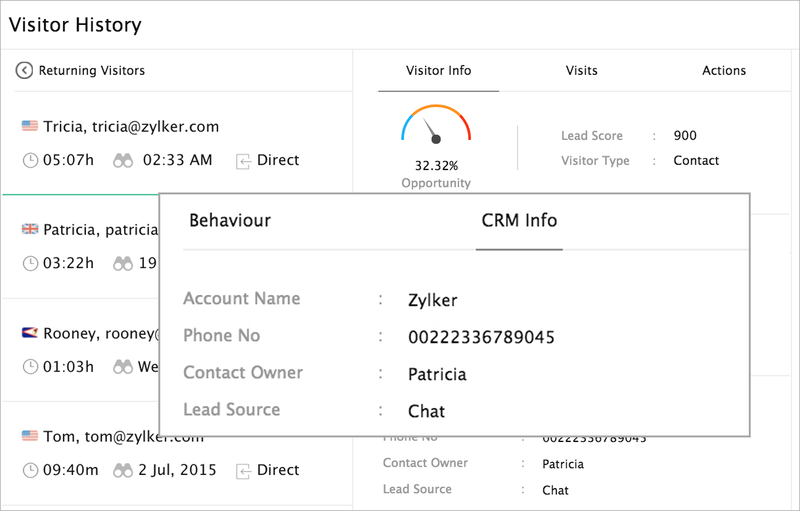 The CRM Info will be displayed only if your Zoho CRM contains the visitor details. If not, the section will not appear. 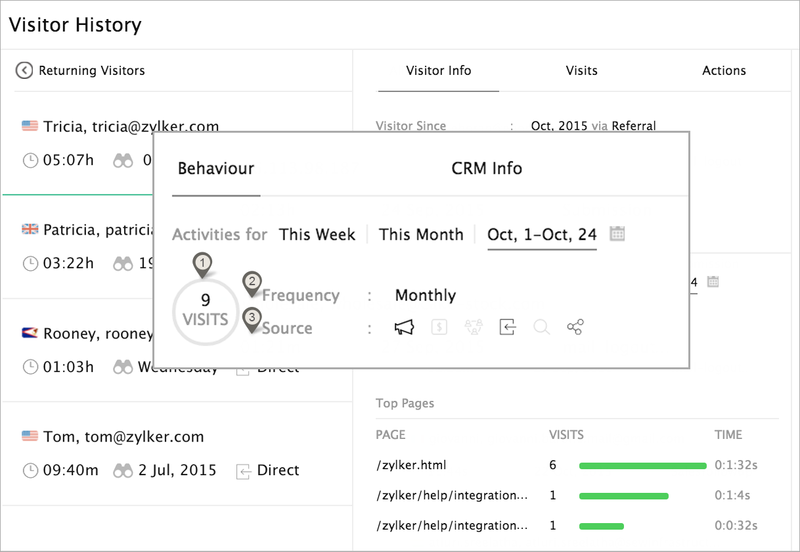 If the Visitor contact has already been pushed to Zoho CRM, then a small icon will appear near the name of the visitor. 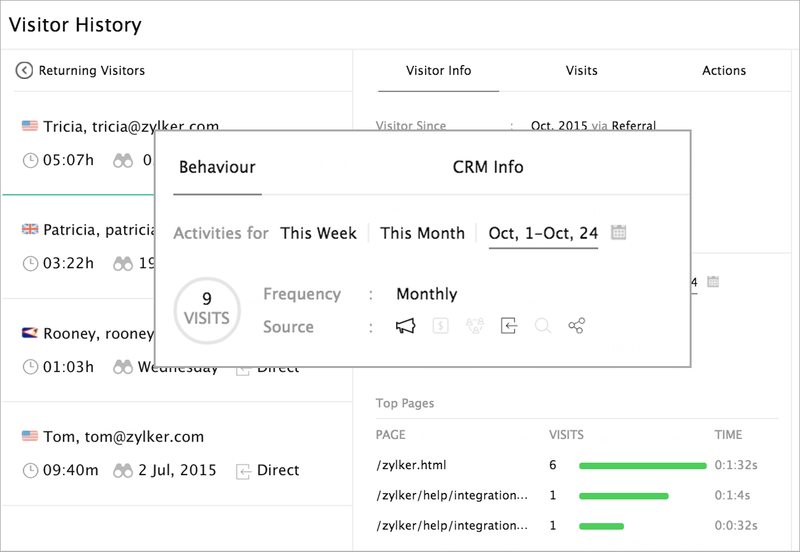 Clicking on this will take you to the Contacts page of Zoho CRM. 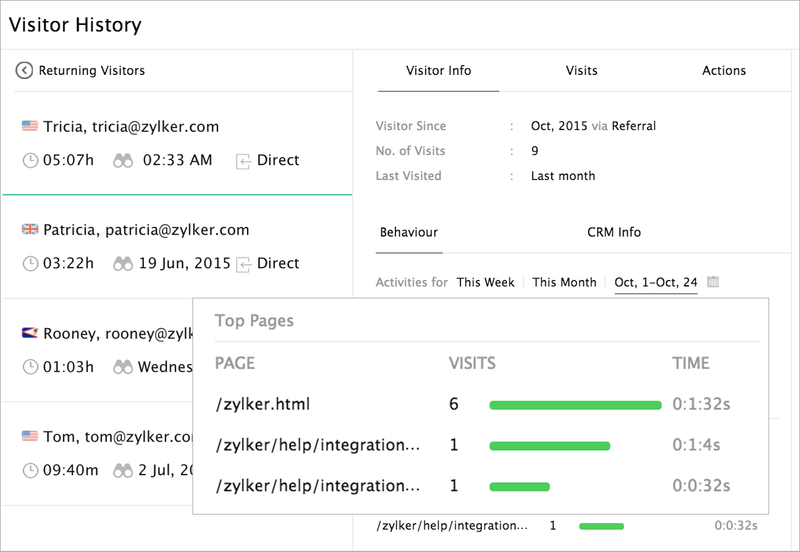 The visits tab lists the details like Landing page, Date and Time Spent by the visitor during each visit to your website. Clicking on the landing page will give you a detailed view that will include the duration of the visit, number of pages accessed by the visitor during the visit, page where maximum time was spent and the source of the visit. Clicking on the 'More' option will take you to the actions section of the particular visit. This section provides the entire list of actions performed by the website visitor and the actions carried out by the operator for the visitor. Landing Page - Clicking on the link will take you to the page visited by the visitor. Date and Time of Visit - Date and time at which the visitor accessed the landing page. Pages accessed through out the visit - All the pages accessed by the visitor will be listed. Chat Initiated - Clicking 'Chat initiated' will open the chat transcript, this will display only the initial chat sent to the visitor by the operator. Chat Ended - Clicking on 'Chat ended' will open the chat transcript, this will display the entire chat conversation between the operator and the visitor. Email Sent - To view the email sent to the visitor, click on the "Mail Sent" and the mail will be displayed in a separate column. Note Added - Clicking on "Notes" will display the added notes in a separate column.